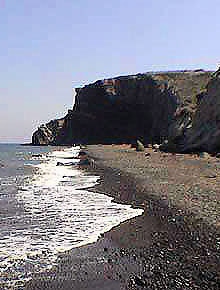 Baxedes - Paradisos Beach is a short drive from Oia. If you haven't already rented a car, you can always catch the bus from Oia bus depot. The beach is recommended for families with children since the waters are shallow, (unusual for Santorini), plus there are several restaurants and taverns, a beach canteen, as well as sun beds and umbrellas on hire. There is also a parking area. Pori is famous for its beaches, vineyards, sweeping views of the bay, tranquility & beauty. Pori has small harbour with fishing boats. The beach is small, quiet and undisturbed with some nice fish taverns, one right on the beach and the other just above with views of the bay. 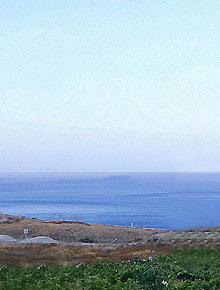 On the hillside are a series of traditional windmills. 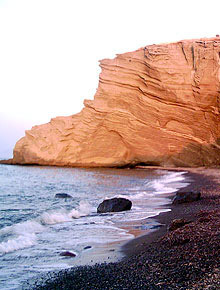 Koloumbo until present day is one of the more unspoiled beaches on the island. It is not organized so take the essentials with you (water, sandwiches etc). If you want to get away from the up-market beach scene in other areas, and opt for peace and quiet, Koloumbo is the place to go. Don't get put off by the walk from the nearest parking place, it is worth the effort.